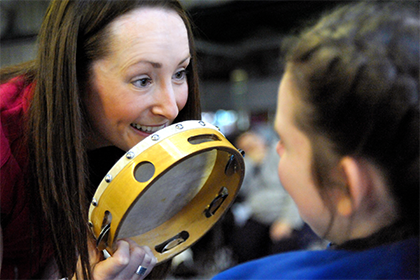 Our Music Therapy sessions offer a creative way to provide therapeutic support for those in need throughout Northern Ireland. There is no specific format to a typical Music Therapy session. 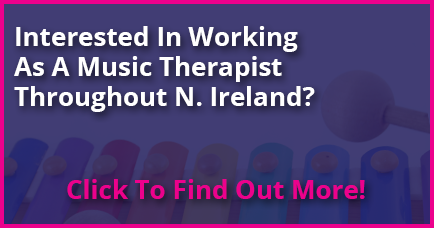 Every client is unique and therefore the music therapist will respond to the clients individual needs and creative direction. As a result, every music experience will match the client’s needs and interests at that present time. Our work is based around the relationship between the individual and the music. Music therapy sessions can be facilitated in a group format or on an individual basis, in a variety of settings including schools, health clinics, community centres and home visits. Instruments are provided and selected to make every session accessible for all participants. Basic social skills – turn taking, eye contact, waiting, listening and active participation. Increase emotional awareness – provides a safe space for emotional outlet. Enhances awareness of self and environment. Decrease inappropriate behaviours and provides coping mechanisms. Improves communication – receptive and expressive language skills. Increase attention span/attention to task. Reinforce pre-academic and academic skills – counting, colour identification, word recognition, etc. Improve motor functioning and skills – movement, range of motion, coordination, muscle control, strength and flexibility, agility, hand-eye coordination, gross motor skills, fine motor skills, perceptual motor functioning, balance, etc. Increase relaxation and stress reduction. For more information on Music Therapy and how it can benefit you or someone you know, please click here. Get in touch to discover more on what we do and how music therapy can be of benefit to you or someone you know.